Moscow accuses Kyiv of deliberately “provoking” a confrontation with Russia, adding that the European Union and the United States are guilty of “coordinating the provocation of a confrontation.” In a special statement, the Russian Ministry of Foreign Affairs warned Ukraine and the West of “grave consequences” that may follow (Militarynews.ru, November 26). Ukrainians are seen in Moscow as proxies doing the bidding of their Western masters and “sponsors.” The Russian defense ministry’s (General Staff’s) threat assessment apparently implies that a future Ukrainian naval base in the Sea of Azov could eventually become a deployment point for Western—that is North Atlantic Treaty Organization (NATO)—ships and forces much better equipped than the small Gurza-M gunboats. Although, those Ukrainian vessels could still play a vital role in guarding this base against Russian commando infiltration. The Azov Sea is mostly extremely shallow: Russian submarines and warships of the Black Sea Fleet cannot operate there effectively, while the US and its allies have some modern well-armed warships capable of operating in the coastal littoral. Ukrainian President Petro Poroshenko has called on NATO to deploy forces to the Azov Sea to counter Russian aggression. The Kremlin insists this would be an extremely negative development (Interfax, November 29). 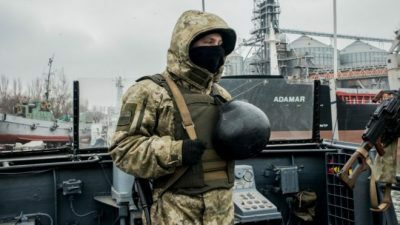 The fact that no NATO member is presently planning to send any ships to the Azov Sea—not even a short friendly visit—will hardly calm the Russian nightmare assessment of the West suddenly achieving naval superiority there. Russia has been constantly using the Sea of Azov and the Kerch Strait to move corvettes armed with long-range Kalibr cruise missiles (potentially nuclear tipped) from the Caspian Sea through the Volga, the Volga-Don channel, the Sea of Azov, the Kerch Strait, the Black Sea, the Bosporus, into the Mediterranean and then back again. These corvettes have been shooting Kalibr missiles at Syria from the Caspian and from the Mediterranean. To attack any other targets in the larger Middle East, the Russian corvettes may use the rear position in the Caspian; to go after targets in the West, a deployment in the Black Sea or Mediterranean is essential. A NATO-backed Ukrainian naval base in Berdyansk or Mariupol could thus seriously impede Russian naval operational plans, Moscow seems to believe.